Any acid (weak or strong) could have high or low concentration. 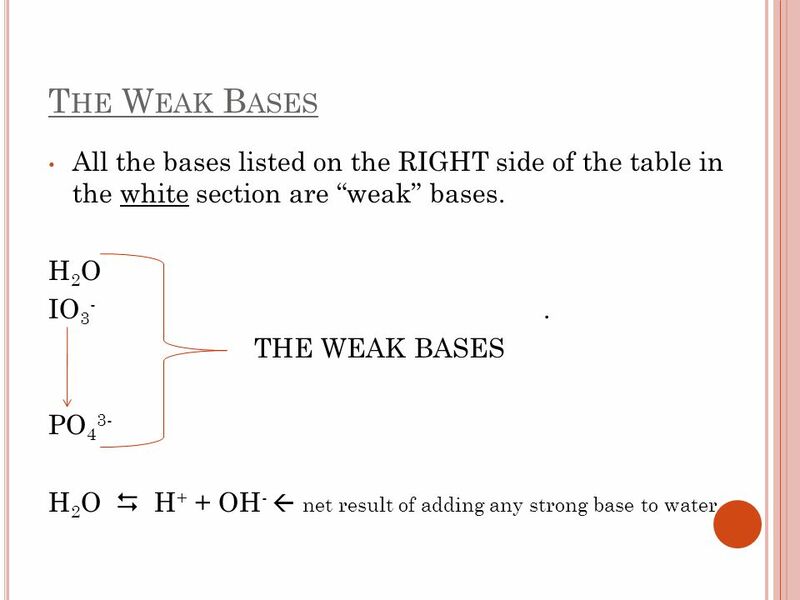 Weak & Strong  refers to % ionization Concentration  the moles of acid dissolved per litre Examples: 10.0 M HCl  conc. 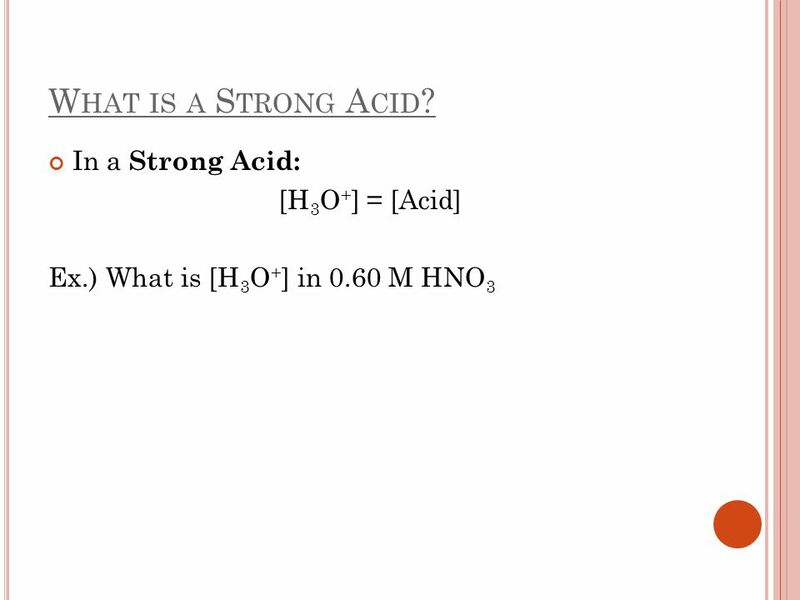 and strong [H3O+] = 10.0 M 0.001 M HCl  dilute and strong [H3O+] = M 10.0 M HF  conc. 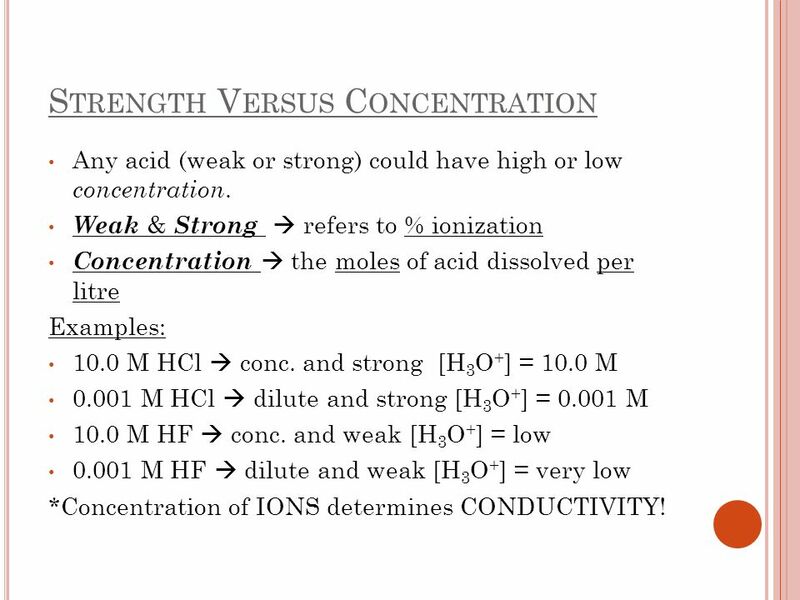 and weak [H3O+] = low 0.001 M HF  dilute and weak [H3O+] = very low *Concentration of IONS determines CONDUCTIVITY! 7 The Weak Acids All the acids listed on the LEFT side of the table in the white section are “weak” acids. H3O+  H+ + H2O  net result of adding any strong acid to water HIO3  H+ + IO3- THE WEAK ACIDS H2O  H+ + OH- Note: The bottom two species on the left NEVER act as acids....SINGLE ARROW GOING BACKWARDS! 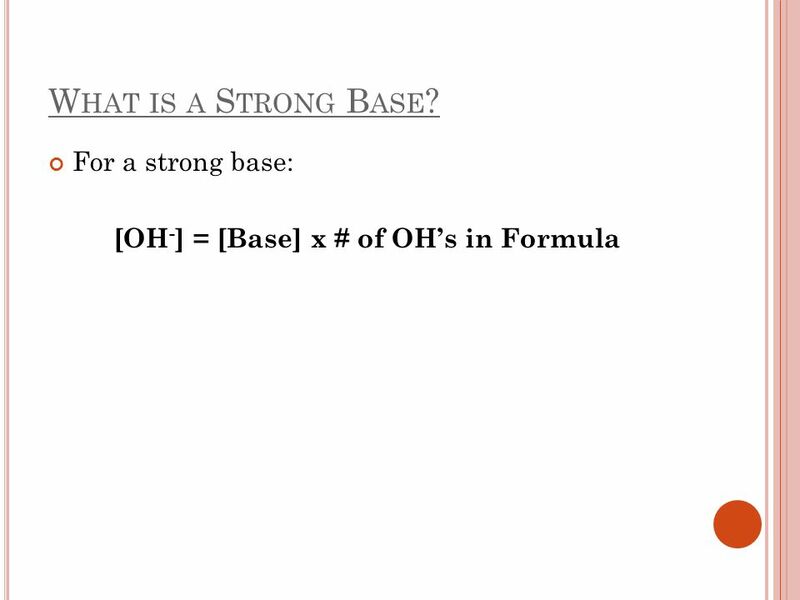 8 What is a Strong Base? 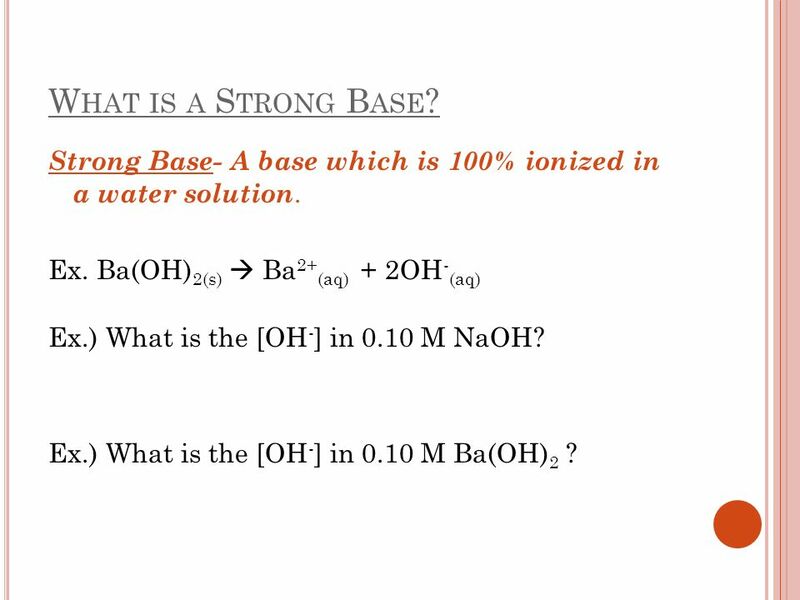 Strong Base- A base which is 100% ionized in a water solution. Ex. Ba(OH)2(s)  Ba2+(aq) + 2OH-(aq) Ex.) What is the [OH­­-] in 0.10 M NaOH? Ex.) What is the [OH­-] in 0.10 M Ba(OH)2 ? 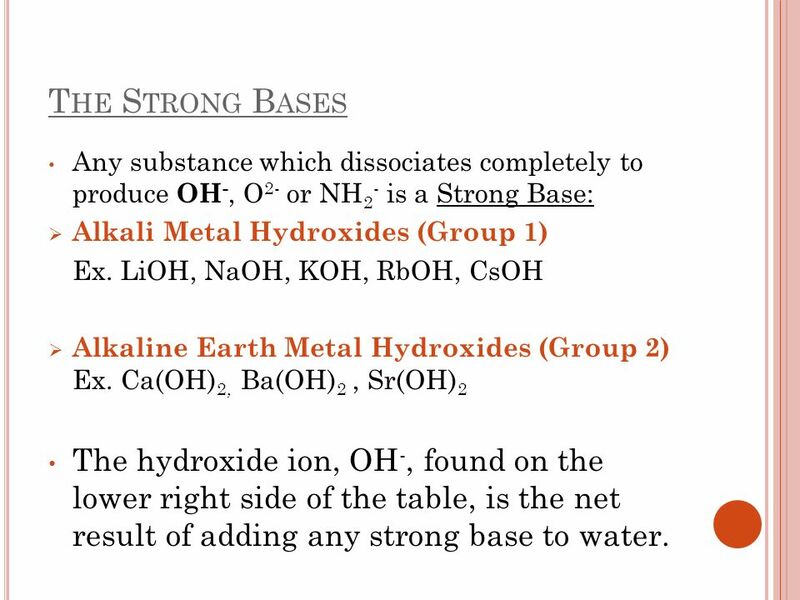 11 The Strong Bases Any substance which dissociates completely to produce OH-, O2- or NH2- is a Strong Base: Alkali Metal Hydroxides (Group 1) Ex. LiOH, NaOH, KOH, RbOH, CsOH Alkaline Earth Metal Hydroxides (Group 2) Ex. 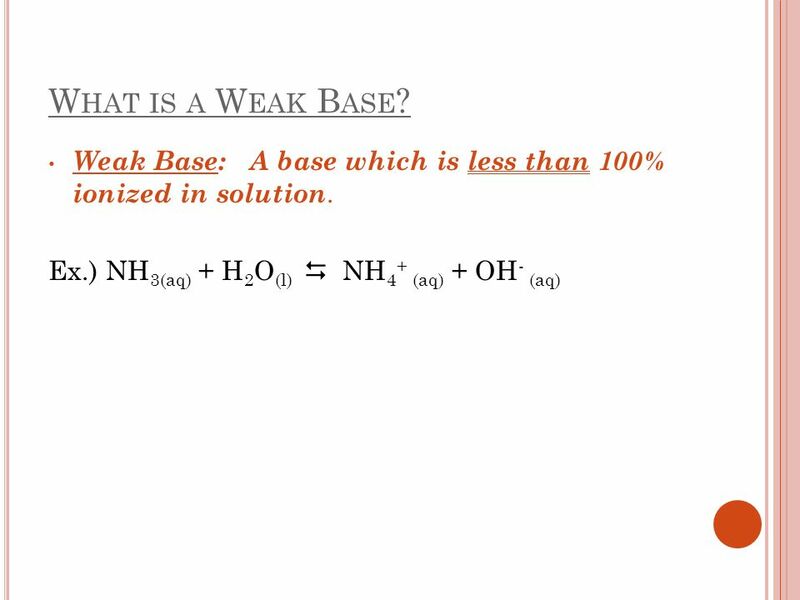 Ca(OH)2, Ba(OH)2 , Sr(OH)2 The hydroxide ion, OH-, found on the lower right side of the table, is the net result of adding any strong base to water. 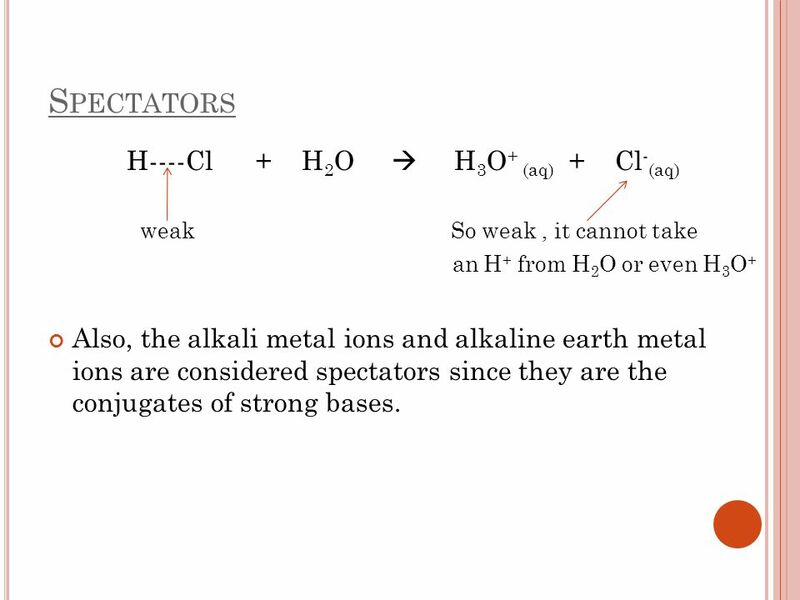 Spectators H----Cl H2O  H3O+ (aq) Cl-(aq) weak So weak , it cannot take an H+ from H2O or even H3O+ Also, the alkali metal ions and alkaline earth metal ions are considered spectators since they are the conjugates of strong bases. What is [H3O+] in 1.0 M HNO3? 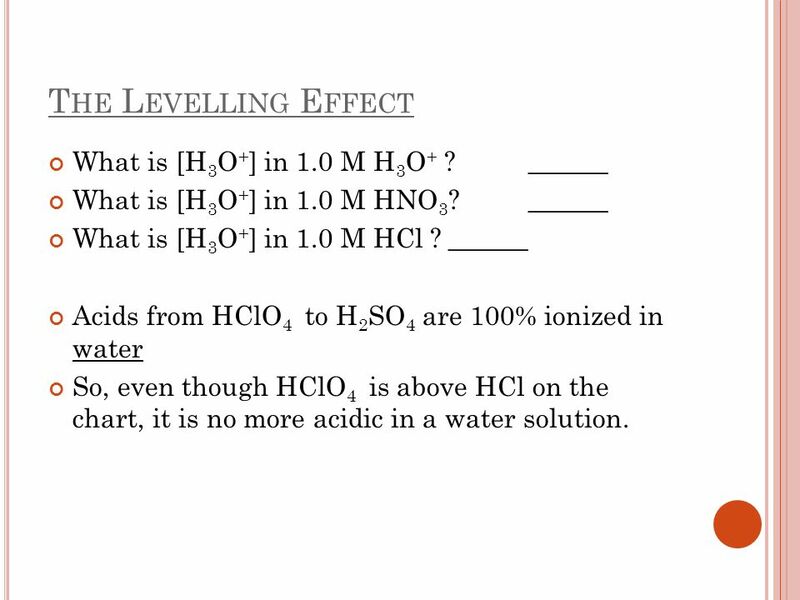 ______ What is [H3O+] in 1.0 M HCl ? 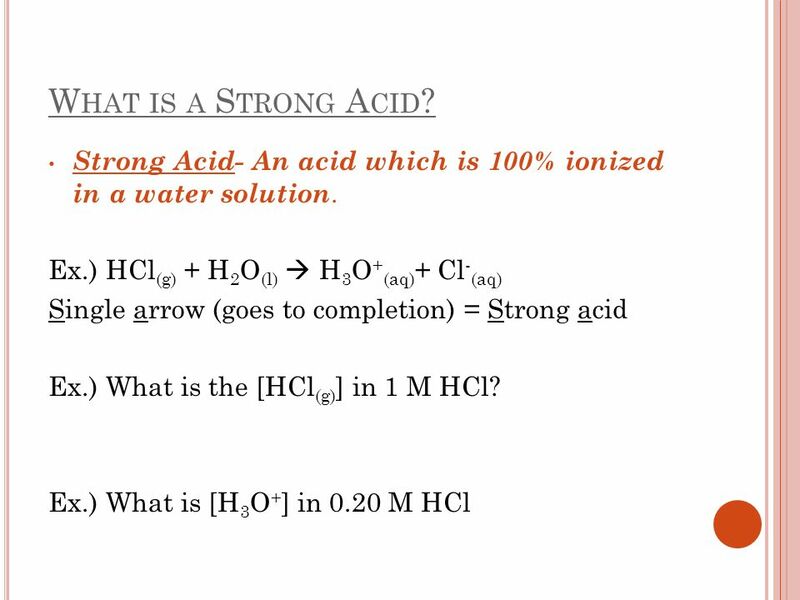 ______ Acids from HClO4 to H2SO4 are 100% ionized in water So, even though HClO4 is above HCl on the chart, it is no more acidic in a water solution. 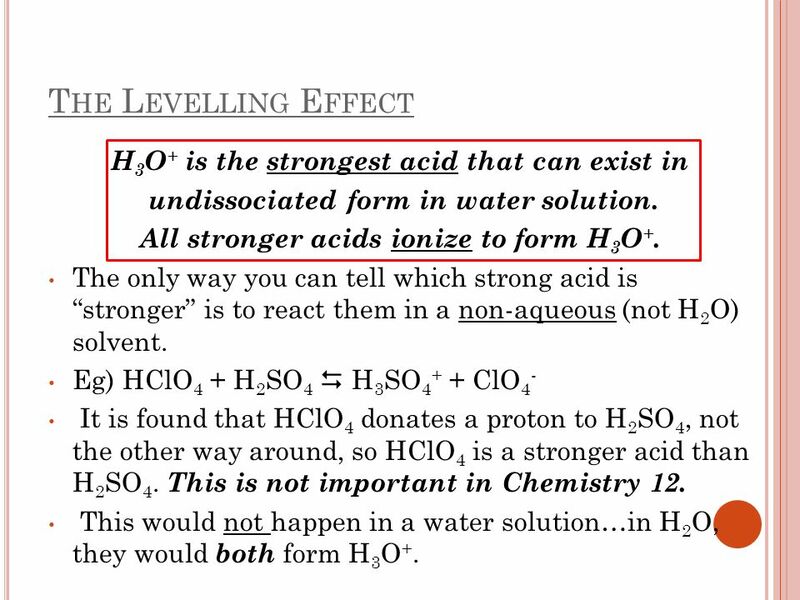 The Levelling Effect H3O+ is the strongest acid that can exist in undissociated form in water solution. All stronger acids ionize to form H3O+. 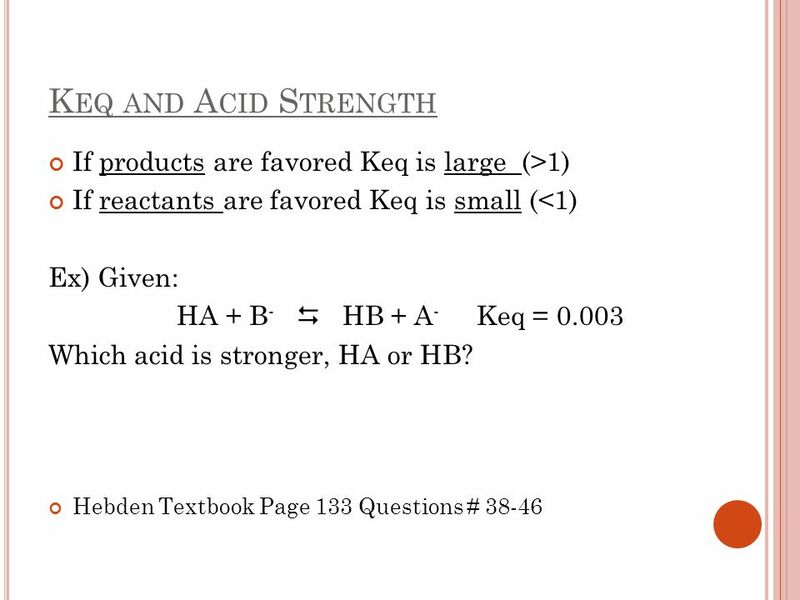 The only way you can tell which strong acid is “stronger” is to react them in a non-aqueous (not H2O) solvent. Eg) HClO4 + H2SO4  H3SO4+ + ClO4- It is found that HClO4 donates a proton to H2SO4, not the other way around, so HClO4 is a stronger acid than H2SO4. This is not important in Chemistry 12. This would not happen in a water solution…in H2O, they would both form H3O+. 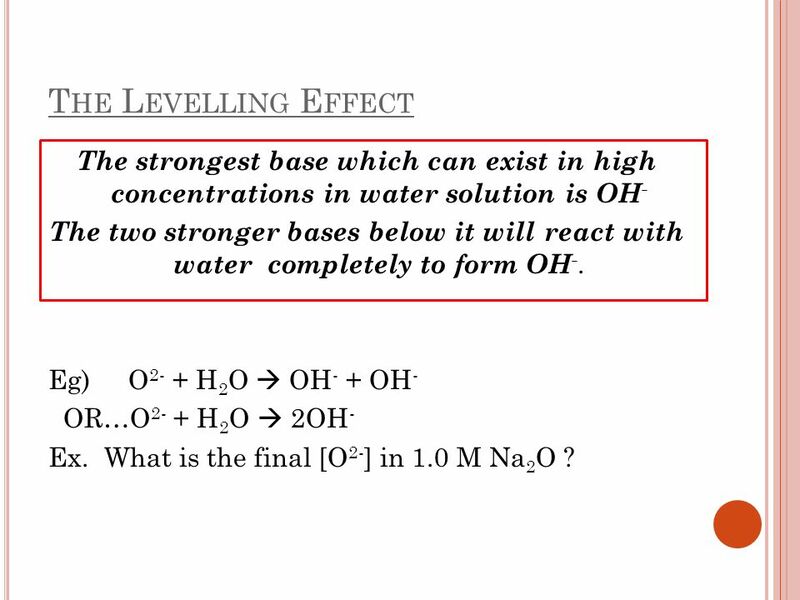 19 The Levelling Effect The strongest base which can exist in high concentrations in water solution is OH- The two stronger bases below it will react with water completely to form OH-. 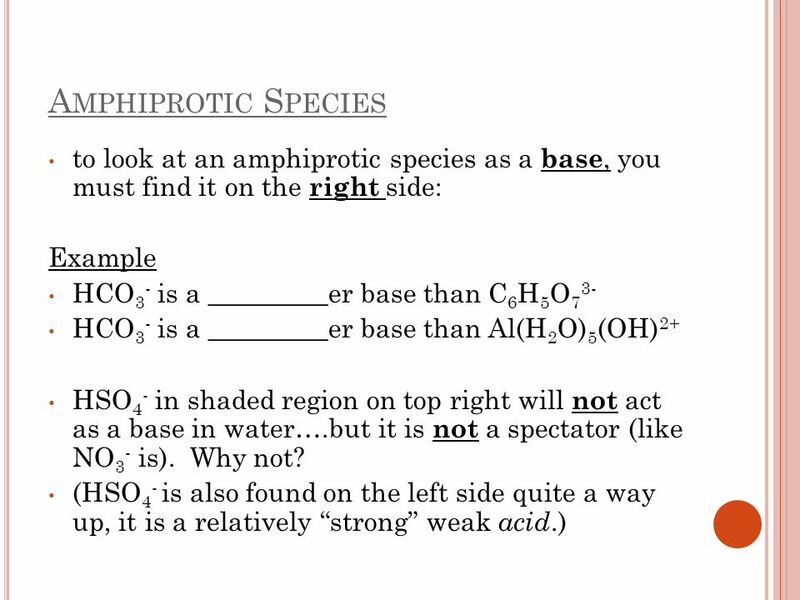 Eg) O2- + H2O  OH- + OH- OR…O2- + H2O  2OH- Ex. What is the final [O2-] in 1.0 M Na2O ? 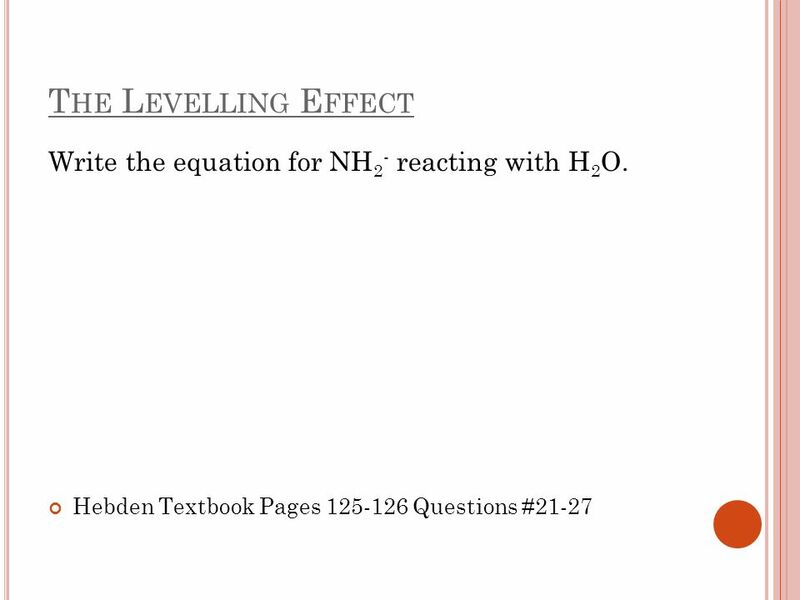 20 The Levelling Effect Write the equation for NH2- reacting with H2O. 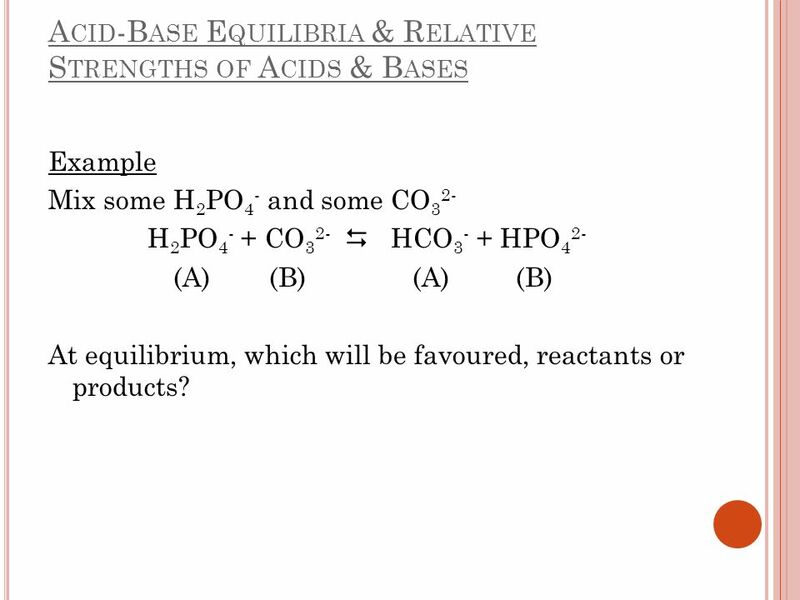 Example Mix some H2PO4- and some CO32- H2PO4- + CO32-  HCO3- + HPO42- (A) (B) (A) (B) At equilibrium, which will be favoured, reactants or products? 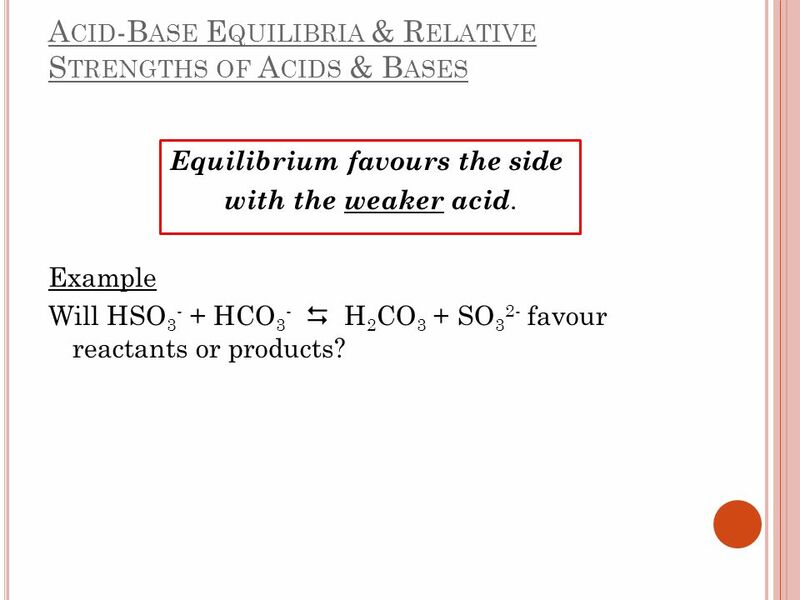 Equilibrium favours the side with the weaker acid. 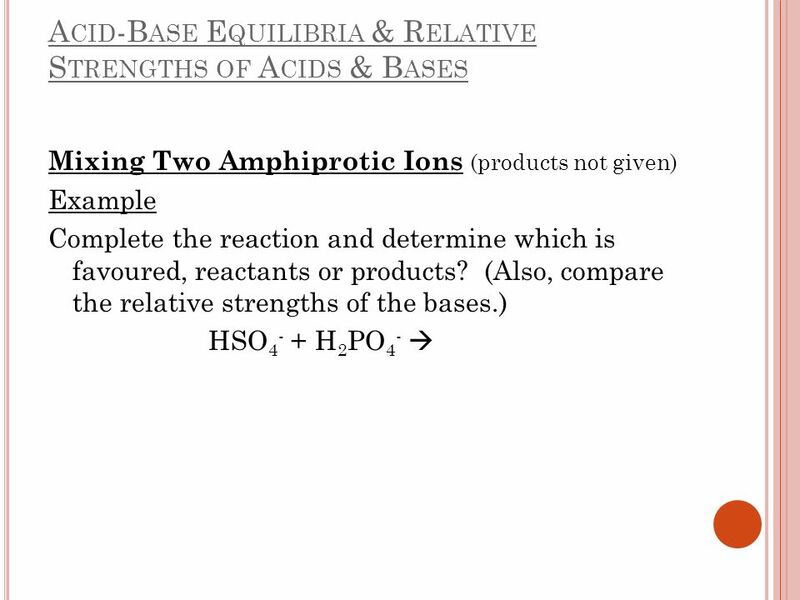 Example Will HSO3- + HCO3-  H2CO3 + SO32- favour reactants or products? NOTICE: The STRONGER ACID is on the same side as the STRONGER BASE. 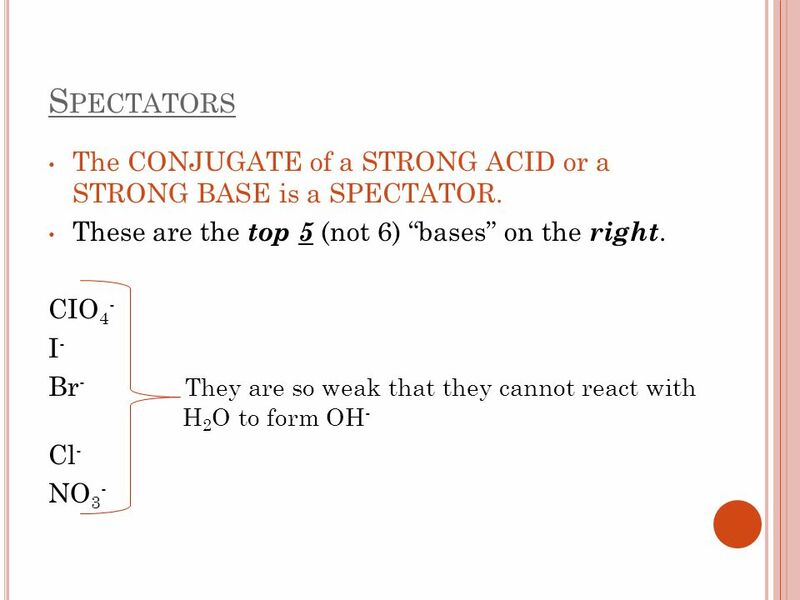 (The stronger acid has the weaker conjugate base.) 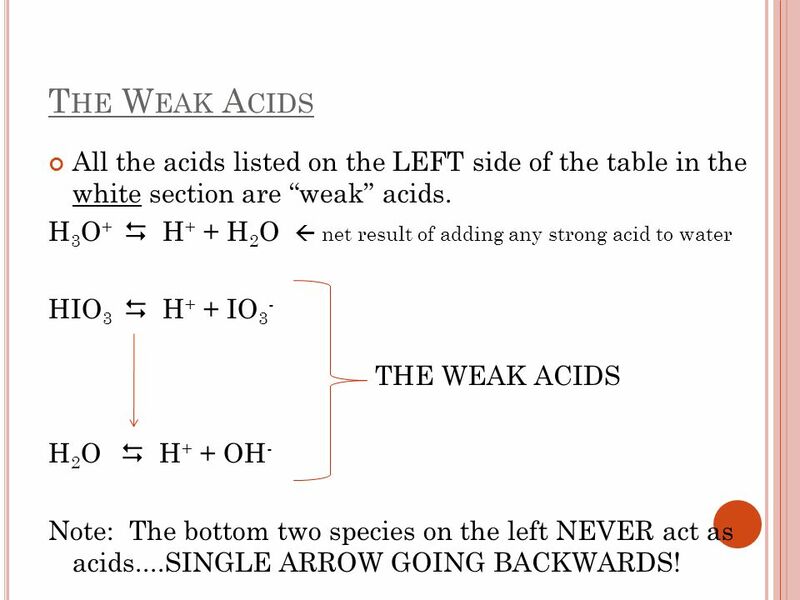 The WEAKER ACID is on the same side as the WEAKER BASE. 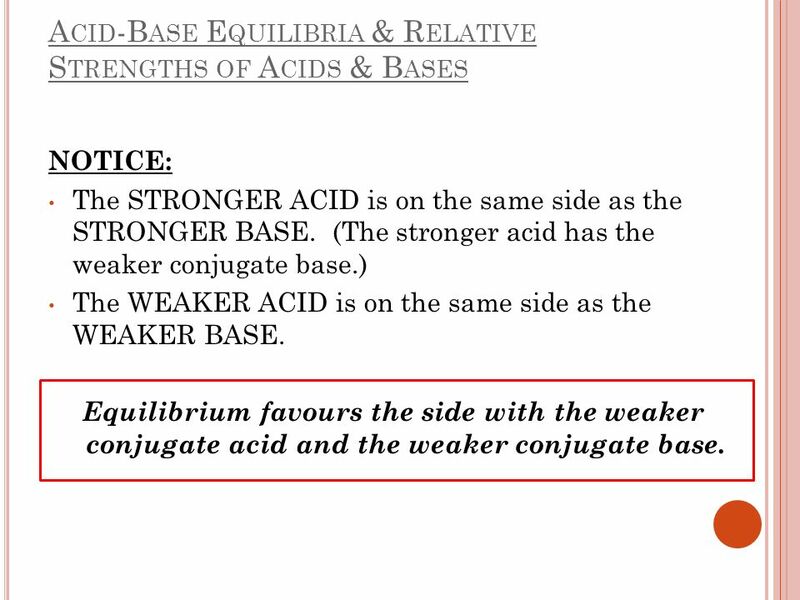 Equilibrium favours the side with the weaker conjugate acid and the weaker conjugate base. 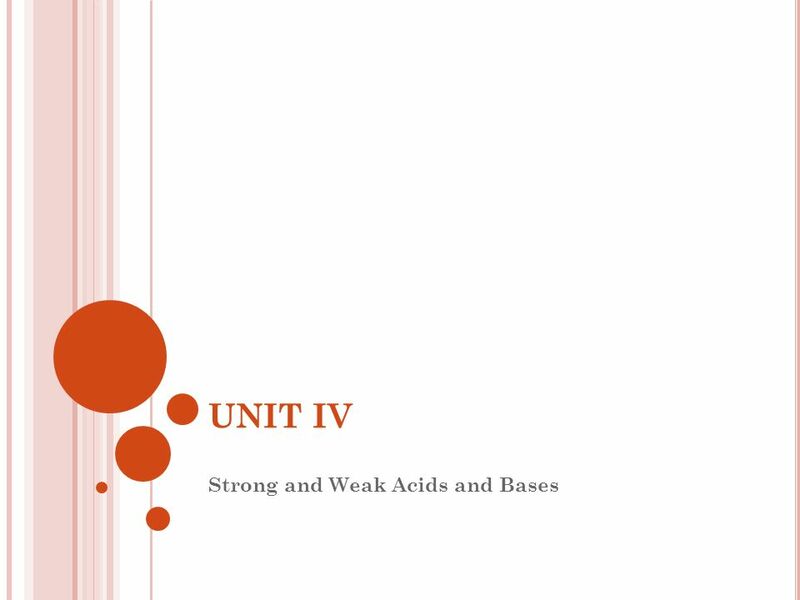 Download ppt "Strong and Weak Acids and Bases"
UNIT IV: Tutorial 14 - Part II. UNIT IV Ka and Kb. IV.13. HYDROLYSIS (Hebden p. 144 – 148). CHAPTER 19 ACID, BASES & SALTS Open Textbook to page 586. CHAPTER 9 CONCURRENT ENROLLMENT. 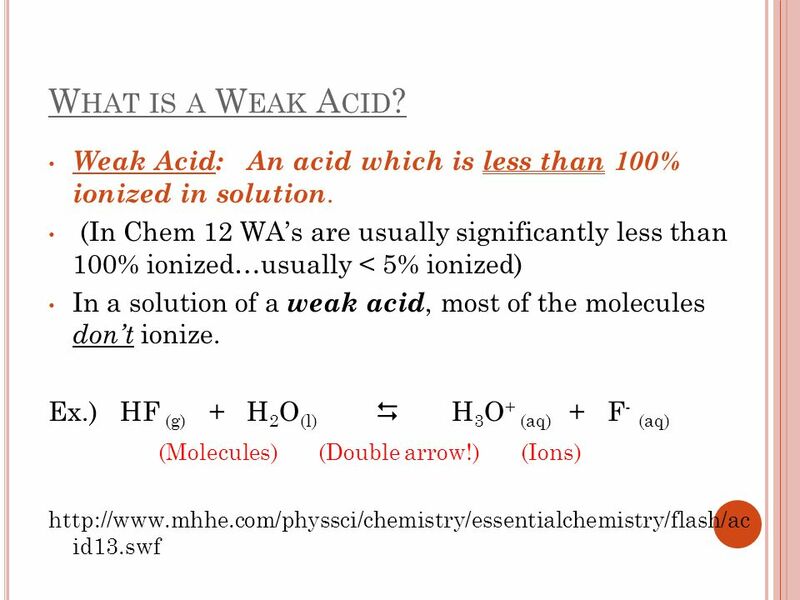 ACIDS AND BASES WEAK ACIDS AND BASES ONLY A FEW IONS ARE FORMED DEFINITIONS –Arrhenius - Acid contains H + ions and Bases. ACIDS AND BASES. HA + H 2 O base acid H 3 O + + A - Con. baseCon. acid B + H 2 O base acid BH + + OH - Con. base Con. acid. S TRONG AND W EAK A CIDS AND B ASES. You have learned that some substances, such as water and the hydrogen carbonate ion, are amphoteric. How could you. 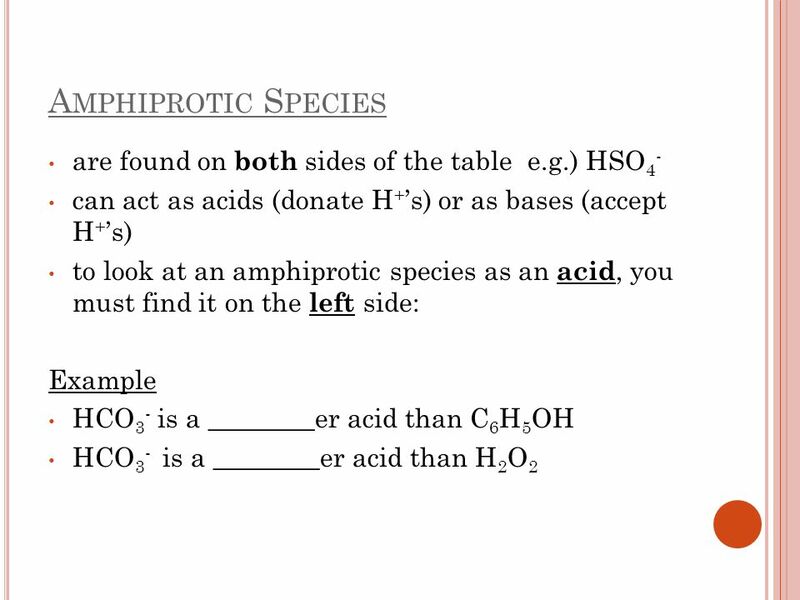 Acids & Bases Properties Acid-Base Theories Acid-Base Reactions. 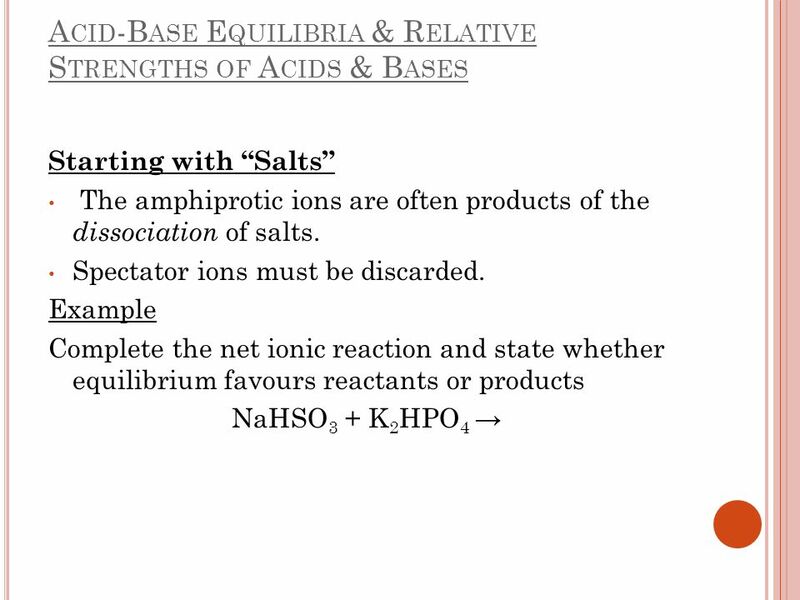 Acids Lesson 4 Acid and Base Reactions. Conductivity The conductivity of an acid is determined by the number of ions generated in a solution and is therefore. 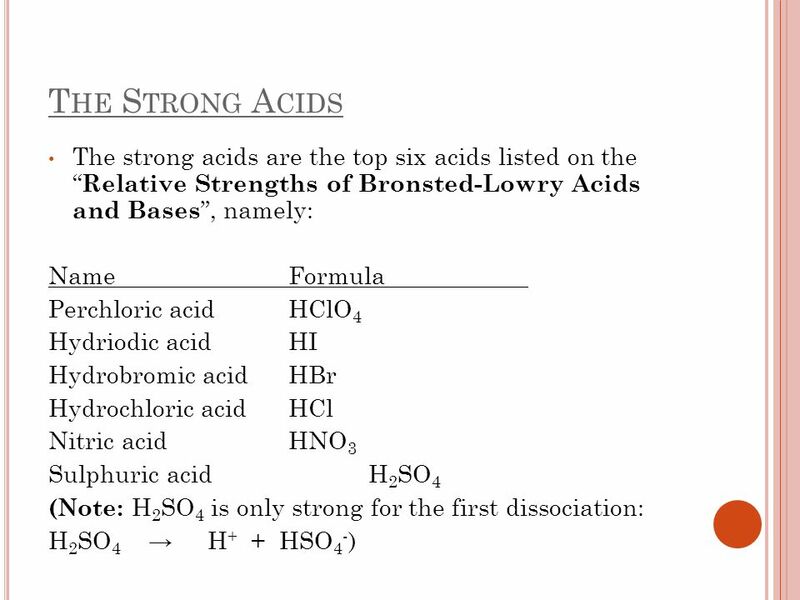 Bronsted-Lowry Acid – Base Reactions Chemistry. Bronsted – Lowry Acid Defined as a molecule or ion that is a hydrogen ion donor Defined as a molecule.